Ladies, the new trend I’ve noticed in the world of Fashion has been gradient, or ombre, nail polish. I, myself, have never been able to perfect this look, but here are a few tips on how to create this look! 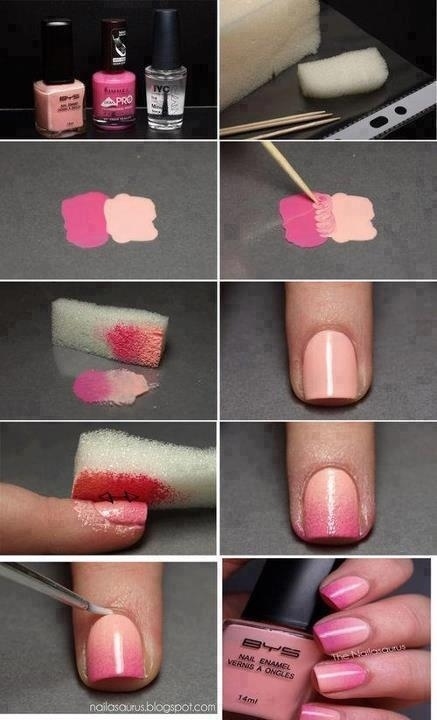 1) Paint your nails the lightest of the two colors and let dry. 2) On a clean, flat surface, paint a generous amount of both colors next to each other onto the plastic. 3) Using a toothpick, swirl the two colors together where they meet. 4) Take your sponge and gently dab it directly on the nail polish several times. 5) Dab the sponge directly on your nail. 6) Once dry, add several layers of top coat. 7) Clean all excess nail polish using nail polish remover and a q-tip.